Quinnipiac University made a voluntary payment of $400,000 to the town of North Haven Monday during a ceremony at the North Haven Town Hall. 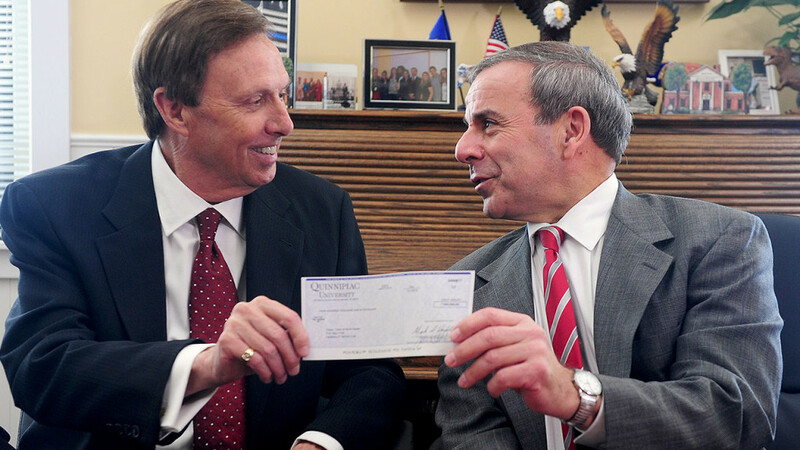 Quinnipiac University President John L. Lahey, left, presents a voluntary payment of $400,000 to North Haven First Selectman Michael J. Freda. The voluntary payment represents 40 percent or $260,000 of the revenue North Haven receives from the state of Connecticut’s Payment in Lieu of Taxes (PILOT) and Pequot Fund allocation, attributable to Quinnipiac. In addition, Quinnipiac will give another $140,000 that will be used for outdoor lighting for the North Haven girls’ softball program. North Haven First Selectman Michael J. Freda said, “The university’s contributions to the town of North Haven, together with its contributions to the economy, truly make Quinnipiac an important and engaged partner within our local community. Quinnipiac University, with its excellent educational programs and striking campus is well positioned to be considered an important asset to the town of North Haven. Freda also credited Quinnipiac with placing value on the relations with municipal authorities. “Quinnipiac has taken particular care to maintain the trust and goodwill of its immediate neighbors who are most impacted by university activities,” he said. More than 3,000 students take classes on Quinnipiac’s North Haven Campus. The university employs 373 faculty and staff members on its North Haven Campus.